Announcing the global re-launch of its Datsun brand, Japanese auto major Nissan today unveiled its hatchback "Datsun Go" with plans to launch a total of three models under the range by 2016, which will all be priced below Rs 4 lakh. The company, which is reviving the brand after nearly three decades of discontinuing the marque, said "Datsun Go" will be available in the Indian market from early next year, and it is expecting 50 per cent of its sales in India to come from Datsun brand. “Today we begin a new chapter in the history of Nissan. Datsun is back… The car will go on sales early next year in India, followed by Indonesia, Russia and South Africa,” Nissan Motor Co president and CEO Carlos Ghosn said here. 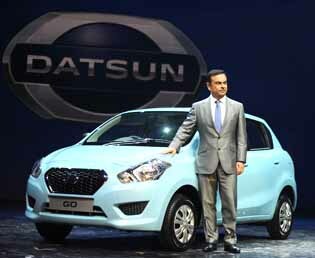 He said the launch of Datsun brand in India is part of the company’s strategy to increase sales from emerging markets. “We have a market share of little over 1.2 per cent in India at present. We are looking to take it to 10 per cent in the mid term (2016). We expect Datsun to play a significant role in this,” Mr Ghosn added. The Indian car market had crossed the three million mark in 2011 and is expected to touch four million by 2016, he added. While he didn’t share the exact price of the car, Mr Ghosn said it will be priced less than Rs 4 lakh.